I mentioned a childhood crush in a previous post. I liked "Land of the Lost" a lot as a kid. And I really hoped that whenever I found crystals that I didn't put the wrong color crystals together and send myself into a helpless coma. Now, how many of you husbands and wives can talk to each other about the crushes you have or had? Mary knows me very well. And we can trust each other with all this kind of information--which could be embarrassing, but--hey, I'm putting this on my blog. So I'm letting the whole world know. Yeah. I had a crush on Holly. Mary liked Holly a lot too. She liked her pig-tails, her independence, and her flannel shirt. Dave S. sent me an email that linked to a photo of the woman who played Holly. Here she is. 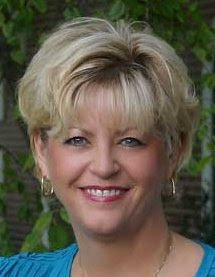 Kathy Coleman. The link leads to her IMDB entry. She doesn't have a lot because Adam 12 and Land of the Lost were her only acting jobs. In the real world she had a family. Somewhere, several years ago, I read that she owned a store selling clothes in Southern California. Good on ya', Kathy. And God bless. 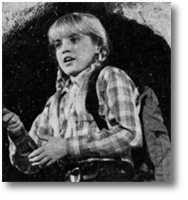 Apparently there is a new movie of Land of the Lost coming out with Will Ferrell starring as Holly's Father, Park Ranger Rick Marshall (known in the TV series as "Marshal" or "Daddy, do something pleassssss!!!!"). I think I'll go to see that movie in the theater. I'm sure he will put the wrong crystals together, even with Enik's advice. With all the family mayhem through the day, we made it to bedtime. Matthew is spending the night at Cameron L.'s place scaring the trick-or-treaters. Louisa went to Oklee to help out in the community festivities. And I got pulled over tonight by Dale B's son, he's a sheriff department deputy. I was going too fast. No ticket, no written warning. Yes. I'll pay more attention to my speed and less to talk radio and the deer in the ditches. I guess that is some kind of compromise. But All Saints' Eve is really about remembering the believers who have gone before us and their testimony to faith in Christ. Read Hebrews chapter 11. It's in the Bible. Note that many, if not most, of the saints listed there were not necessarily supported by friends, family, community or church. Especially note Isaac. He wasn't even supported by his own works. Contrary to his own wishes, he blessed Jacob rather than Esau. And this, God says, was done by faith, not by works. Now read Ephesians chapter 2 about faith and works. God bless, Happy All Saints' Day. Sounds of movement in the other rooms-clock-time-5:30am. Ugh. Stella's in bed with us. "Stella, quit putting your finger up my nose." Matt made coffee. Thank you. Voice from the bedroom "Did you leave the camper door open?" Two new jack-o-lanterns, already carved appear in the hall. Did the Great Pumpkin visit us? Getting ready for breakfast: "Who put the cats in the van over night?...You go clean it up." Milk, cream, juice, the containers wedged into the door compartment. Matt pulls, the shelf falls. Children brokering deals over who does what job for cleanup. Donna fills her pants. Her diaper runneth over. How can such a small child contain so much? Mary shouts, "Get me the Basic H cleanser mix please." Little feet running up and down the hall. "Get out of that room!" "Did you get the van clean? maybe they were very good." "ub, jeep, wabba, soo, grb," says Donna. "Donna, get out the that closet." Time for music? "Who broke this?" "Matt, take the record player out to the burn pile." Freezing tomatoes depends on electricity, or, if you have it, a gasoline or other fuel powered freezer. Drying tomatoes requires dry heat. That's ok if they ripen early enough in the season for dry heat to be available. Otherwise one is dependent upon gas or electricity for drying. 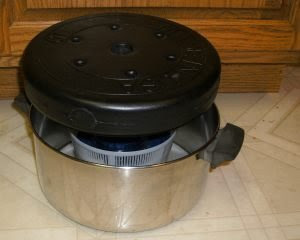 Canning tomatoes requires a stove or fire. One option we've heard of and are trying this year is wrapping tomatoes individually. The technique suggested to us was that if tomatoes were individually wrapped and kept cool, that they would keep for a fairly long time. When needed, the tomatoes were to be taken out, ripened on the window sill, and used. We'll see if this works. Our green tomatoes are individually wrapped and in a box in our garage. We'll set off part of the garage under the steps to keep it a bit warmer than the waaaay below freezing temps that we experience. Hopefully we can keep them above freezing and below 40 degrees. Jaime and Laura's family gave our kids some pumpkins. Louisa made a really, really good pumpkin pie. 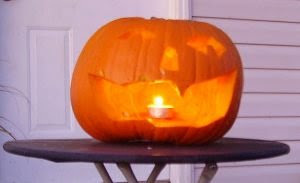 Matthew carved his for a Jack-o-lantern. When we were kids, my mom only let us use magic markers. Then she would save the pumpkin meat for food. The results were pretty good. 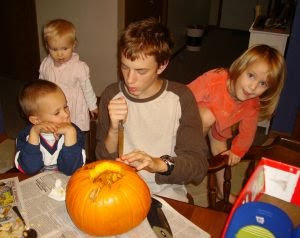 I remember in college at U.W.-Madison we had a pumpkin carving contest. I did a Sleestack head. I probably still had a crush on Holly at the time (picture here). I didn't win. Matt's pumpkin would have beat me. Last Sunday we held Reformation Festival based on St. Paul's letter to the Ephesians 2: 1-10. We had a joint service at Oak Park for the whole parish. I did have services at Mt. Olive on Sat. with Sat. School. But on Sunday we had one service with the kids singing ELH 72 "Thy Strong Word" and a focus on the power and singular authority of God's Word. Ragna G.'s daughters donated a stained glass window in memory of their mother. You can find more about her story by clicking this link. The window her daughters donated was the final window in the sequence of windows at Oak Park. 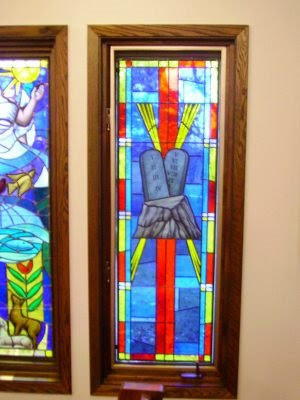 This trio of windows shows the work of God in Creation and the Law. Another trio shows the work of the Son in Salvation. Another trio shows the work of the Holy Spirit in the Church. At the front of the church the means of Grace: Baptism, the Word, Absolution, and the Lord's Supper are portrayed. The portrayal of the Creed is complete in our windows. Thank you, ladies, for your wonderful gift. 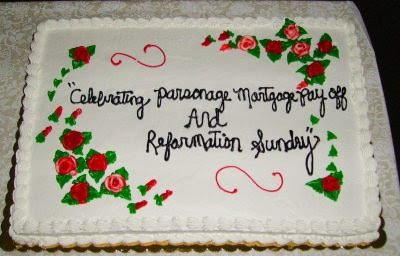 We also celebrated the complete payment of the mortgage on the parsonage. Pr. Sparley initiated the construction of a parsonage for this parish. This September the parish completed paying the mortgage. We burned the mortgage in front of the church. 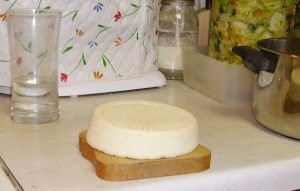 The pressing of the cheese is done. Now I have to let it dry out for a few days until it develops a good rind. Then I'll wax it and let it cure. Lisa, thank you for the cheese making kit. Sorry it took so long before I used it. Matthew and I went to TR today. Mavis has pneumonia and is hospitalized. She rattles a bit with each breath and is on some strong antibiotics. Please keep her in your prayers. I picked up some ingredients for Kimchee and made a gallon and a quart. This will sit and ferment for about a week. Last week I put up some fish and pickled it. That should be ready on Saturday or Sunday. 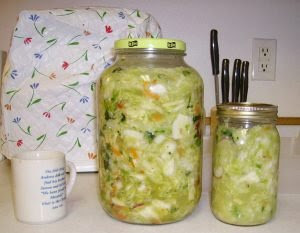 I don't know if I mentioned it previously, but I put up about 3 gallons of sauerkraut to ferment a couple of weeks ago. It's all in jars and in the fridge downstairs. Yum! 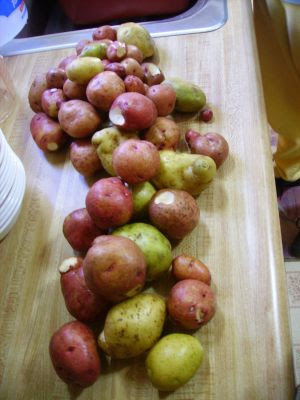 And about a week and a half ago Matt and I brought in the potato harvest. We got about 50 pounds. So, that will last us about a month, maybe a bit less. Next year we'll plant a lot more. I'm glad for grocery stores. We have 1/2 a hog waiting for us at the Oklee locker. Jaime, thank you. Now we have to figure out what we owe you in addition to the locker. Scott and Diane, here's the first. 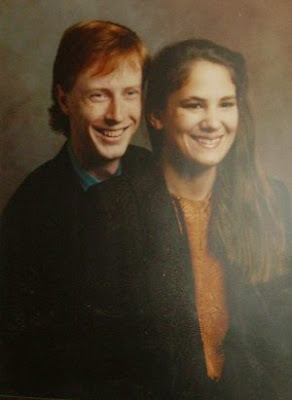 For the rest of you who may not know or remember, this was our engagement photo back in August of 1989. O.K. I tried to make cheese tonight. My sister-in-Law, Lisa, gave me a kit for making cheese two Christmases ago. I thought that some of the yeasts and bacteria sent with this kit might be dead. I was able to get a clean break in the curd fairly quickly. After the clean break I cut the curd a bunch of different ways. 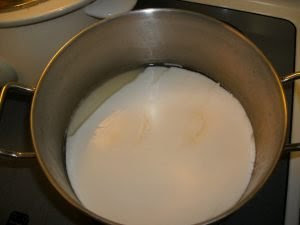 The point was to make a bunch of small chunks of curd that could loose the whey they contain fairly quickly. 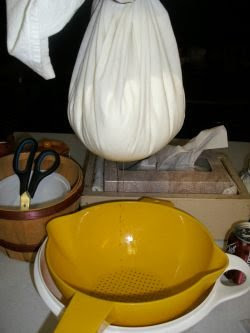 After the curds shrink, then they are put into a hanging cloth to drain. I used shoe string and a dish-towel to hang the curds. We kept the whey for baking and such. After drying for a while the curds are opened up and broken up into walnut sized chunks. 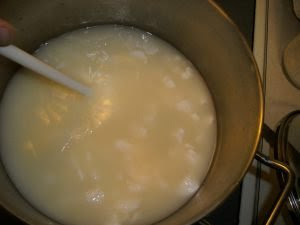 Here are the curds just after hanging and drying, but before breaking. 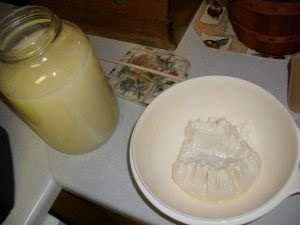 After the curds are broken they are pressed so that all the whey is removed. Later on they will be left out to dry and then set to cure fore a couple of months. 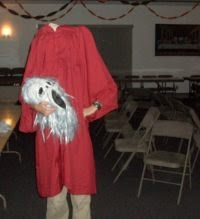 I remember doing a headless costume in my grade school years. And, one of the things Mary and I are concerned about is how much our children inherit of our bad habits. So, here is Matthew at the Youthgroup party for All Sts' Eve. 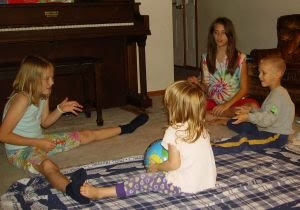 We had games and Bible Study at the party. But Matt taped a cardboard box to his head so it would look like his shoulders. The Satellite photo didn't work out from google for B and R guns. Ignore it. It just shows TR. Well, family-wise, we've been doing a lot. Matt and I got the potatoes out of the garden. The harvest was about 50 pounds. I put up about 5 gallons of sauerkraut. It's still fermenting. 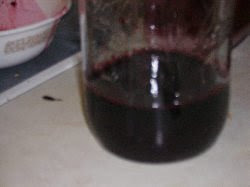 The wild-grape wine is still bubbling away along with some beet juice, apple, and corn wines. We still have to preserve some more beets and a bunch of carrots. We've frozen some garden foods. If the electricity holds out until winter we'll be doing alright. A week ago, on Friday I finished a search for Matt. He's been asking Mary and Me if he could get a previously owned .30-30 lever action rifle for deer hunting. I called all the dealers from Warrod, Stockholm, Thief River Falls, East Grand Forks and South. They all say, "sorry, we don't have one right now. As soon as we get one in someone buys it." Matt likes the lever action .30-30 because he got his first deer last year with Darrow L's Winchester model 94. Well, I found one for him just a few miles south of Wadena at B and R Guns. Here's how the sale played out. I called B and R Guns. I think I talked to Bryan. He said that they had one used lever action .30-30. It was a Marlin 336. But there was a defect on the gun. The loading port was loose and needed to be fixed. The price was $195. Matt, Mary, Donna, and I went to the gun store. When we got there Matt and I checked the gun out with a couple of live rounds, but the action froze. Bryan was really sorry that we'd come all the way from TR to buy the gun. He was able to get the rounds out of the action, and make it work a bit. But the gun needed a gunsmith. So he told Matt that he would sell the gun to him at cost if he wanted it. $100. Last Saturday, after church and Sat. School, I came home and downloaded the diagram and manual for the Marlin 336, I found that the loading port screw was loose. I tightened the screw and the action worked fine. So I took the gun to Gary Hougan, our TR gunsmith. He'll check it out for any other defects. The inspection will cost about $25. So, hoping that there are no other problems, Matt got a Marlin 336 for $125. That's a really good deal considering that this particular 1980 model sells for around $350. OK. Lots of stuff during the week. But fast forward with me to tonight. Saturday night and Tuesday nights are bath nights for the little kids. The older kids take their showers as needed. But Donna wasn't patient enough for us. Tonight she stepped into the bath with her clothes on. I was getting supper ready. Mary was working in the living-room. I heard Sophie cry out about Donna. I came running to the bathroom and there was Donna, all happy in the tub. Louisa took care of her while I got supper on. This evening the kids and I watched "The Forbidden Kingdom" a Jackie Chan and Jet Li movie from last Summer that came through the Library. After the movie, when everyone was going to bed, Elsie and Clara discovered mice in their room. We brought the cats in and they caught two mice. One got away. I'll have to set up traps this evening. It's fall. That's when the critters seek warmth. Even though I threaten that I'll get rid of the cats because of their messes, I'm glad we have them to keep the other critters away. I've had my email address since I started as Associate Director of Bethany Lutheran College Library and Professor of Bethany Lutheran College in 1995. As Lorne Green said in an Alpo commercial in the 1970s, "Duchess is 13, that's like 91 to you and me." 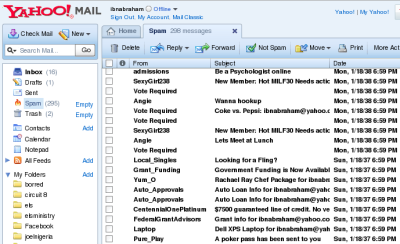 Yahoo has been like Alpo in filtering out my spam. I only get real beef chunks, with no cereal. I checked my email this morning at around 10am and deleted my spam. Tonight I have 293 unread spam messages. Occasionally the spam filter grabs a legitimate email from a friend or someone else. I check through the spam, but I don't always catch the legitimate email. So, I'm sorry if I've missed something that one of you sent. Here are some examples of the spam I get simply because my email address is so old (in "Internet years"). There is some good wisdom in changing one's email address now and again. The main concern is Identity Theft. A lot of people experience identity theft. They become careless with which companies know their credit card and social security numbers. There are some companies who are able to protect careless people about identity theft. I'm not really concerned so far. The main reason I haven't changed my email address in so many years is that I'm lazy. Yes, even though I do so much work for my family and parish, I don't want to have to mess with the details of all the Internet service providers about all the things they need to rearrange if I change my email address. So I get a lot of spam. I deal with it by pressing "Delete." A week ago, Monday; I had a funeral service for Patty G. This is the 6th funeral the G. family has had in 18 months. And this week I had Nancy T's. funeral. Nancy and I have been working together since 2002. She was one of my organists at two of my congregations. And she didn't hesitate at playing at the two other congregations I have. Nancy shared her struggles with cancer with me through the years. Attentive readers will know about Lyle M's. funeral. It was that same day that Nancy (while serving a meal for his funeral) was too ill to continue. I went to the hospital in Grand Forks to see her that same evening. Her husband, Gene, called me just a few minutes after she died. I went to their home and stayed until the Undertaker came. Each year the funerals become harder for me. I think that most readers will understand why. Nancy had talked with me about her funeral a couple of months before she passed away. I'm glad for that. This meant that I had a few weeks to prepare my sermon for her funeral, rather than a couple of days. Please keep Patty G's. family and Nancy T's. family in your prayers. She is the 22nd funeral I've had in 18 months. We've lost a lot of friends. Perhaps this may be why so many pastors choose to leave their congregations for another call after just a few years. If so, the people who live here don't have a choice. They have to face tragedy every time. Mary and I celebrated 19 years of marriage on ראש השנהRosh Ha-Shanna (Hebrew New Year), September 30th, 1989. Mary, thank you for marrying me. Thank you for our 9 children and the next one who, God willing, will be born this December. Jaime and Laura D. celebrated with us: their wedding anniversary is just a few days later. Thank you, Jaime, for your generosity that night and in all the different things our families have dealt with. Allison, I am glad that you were able to be there. By the way. I made a cordial from our home grown raspberries. The Evergreen restaurant was very gracious in letting me bring the cordial in for Jaime, Laura, Mary and me to toast our anniversaries. Thank you, Judy. And the cordial was really, really good. I love you, Mary. Happy Anniversary. 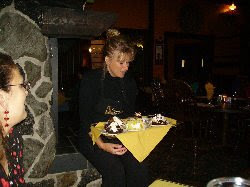 After our meals of steak and seafood and extravagance, our waitress was willing to have her photo published on the web without her name. She was really a good help. Especially considering my Celiac disease. A few weeks ago we went over to Jaime and Laua D's farm to help them pick wild grapes. The whole harvest looked to me to be about 6 bushels or so. We took home about a 1/2 a bushel. 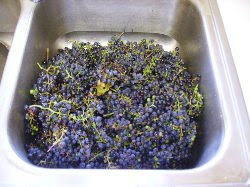 Here are some of the grapes in our kitchen sink. 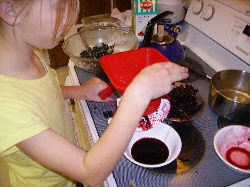 Elsie and Clara helped me juicing the grapes. We kept to two parts separate: the first pressed juice and the castings (the vines, peels, and seeds) separate. It took a long time with our small juicer. I'm really thankful to Elsie and Clara for their help turning the juicer. Wild grapes are really tart! Sorry this last pic is a bit blurry. We ended up with about 2 gallons of first press juice. I mixed another 3 gallons of sugar water to this for a good fermentation. I took the pressings (the vines, grape peels, and seeds) and boiled them for juice. This resulted in another 5 gallons to which I added sugar and yeast. So, hopefully, we will have a nice wild grape wine for Christmas gifts. If not, we will have a nice wine for Easter, or we will have a wild grape vinegar for cooking. Of course, I might have to throw away a rotten batch. But I hope my family and friends can have something they will enjoy. We celebrated John's birthday on the 26th of September. He was born at the same time my brother died in an accident while repairing an automobile. John loves automobiles, just like my brother, Jeremy, loved them. If I might repeat myself, while we were driving in Thief River Falls we were behind a diesel fueled pickup truck that put out a lot of smoke. At the stoplight John exclaimed "What is that smell, that really, really good smell!" We consider ourselves so blessed by God to have 9 children and one on the way--expected to arrive in early December. We don't have a name yet for the new arrival. Just as long as the name of our child honors Scripture, our families' heritage, and doesn't make a faux-pas with regard to the new arrival's initials or name. Thank You, God for letting us have John with us through these years. Please grant to us many years of growing together in Your Word. On the last Saturday of September Oak Park hosted the Northern Circuit Women's Guild meeting. Pr. David Thompson presented on the topic of World-Views and how those world-views might influence the way we and our children think in ways contrary to Scripture. 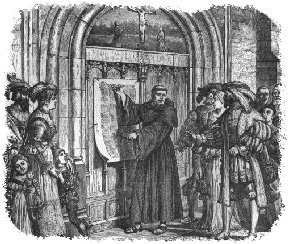 I taught on the topic of Lutheran History in the United States and the root causes and reasons as to why there are so many different kinds of Lutherans today. 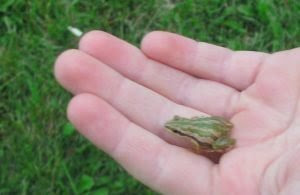 Sometime during these days we found a small tree frog. Clara held it for me to photograph. It is beyond my imagination how God can make a creature so complete and so small. Evolution, and the theories and science espousing Naturalism cannot begin to explain such beauty and complexity. It can only appeal to random chance and refer to time immeasurable for the random likelihood that such a creature could be developed. These appeals to time and random chance are false hopes for people who desire that God does not exist, that they are not guilty before God's Law, and who hope that there is no such thing as the resurrection of the flesh and Judgment day. I held a funeral for Patty Good this past week. The Good family has had 6 funerals in 18 months: Willie, Bert, Ella, Yvonne, Tina, and Patty. I have served 5 of those 6 funerals. I and my familly have been here for 7 years now. Funerals become harder and harder for me when someone I have known for a long time dies. Nancy T. died this week. Her husband, Gene, called me within minutes of her death. I was able to be with Gene and his children at Gene's home in a few minutes. Last May (I think it was) I announce that Nancy had first started playing organ for worship at Oak Park 50 years ago. Gene's birthday was a few days before his beloved bride died of cancer. I can't count the number of times Nancy and I had together while driving from one church service to another. Remember. I have 4 congregations, three of which I serve with the Divine Service on Sunday. Nancy and I had a lot of time to talk with each other, and to know each other's problems. When I first arrived in this parish I was faced with 13 funerals in my first year of service. Over the years the funerals have become harder and harder. It's not because I doubt God's promise of forgiveness in Christ or the resurrection to eternal life. I know an have a deep trust that these are true simply because God says so in His Word. The reason the deaths have become harder is that I have come to know and love these members of my congregations as my own family and close friends. Nancy's funeral will be on Tuesday. It will be hard for me to speak. But I will. Nancy had a very clear plan for her funeral. She had given it to me almost 5 weeks before she passed away. I am very happy with that. It means I can focus on the message and not on the other things which can distract from God's Word during a funeral. Now, on a different subject which is based in the same Grace of God in Christ: Today I was given the privilege of Baptizing Carter H. If you look back in the posts in this blog you can figure out who Carter is. 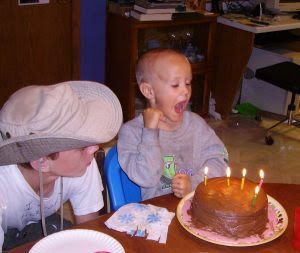 On this same day we celebrated the birthday of his older brother Clancy. I baptized Clancy three years ago. Please keep all those whom I have mentioned in your prayers. Please include Gloria R. whose osteoporosis prevents her from having a pain-free life from now until her resurrection. There is a lot more news. But I have been too busy to have time to sit down and write in this blog. Thank you, all of you who read this blog and keep me and my congregation's in your prayerss.